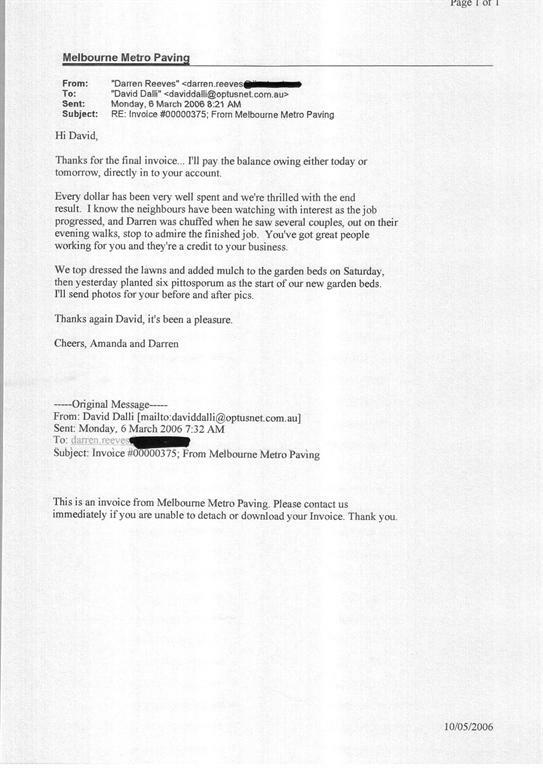 A Better Driveway was formerly called Melbourne Metro Paving. 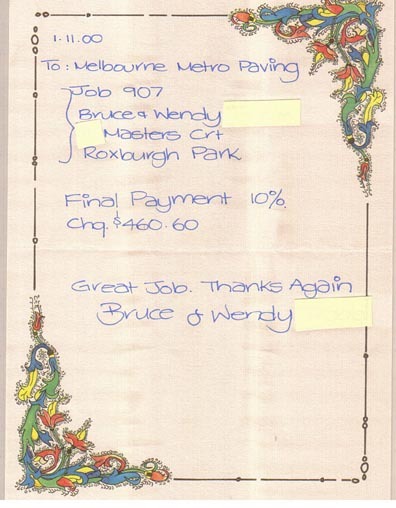 Hence some of the images carry Melbourne Metro Paving in the testimonial. 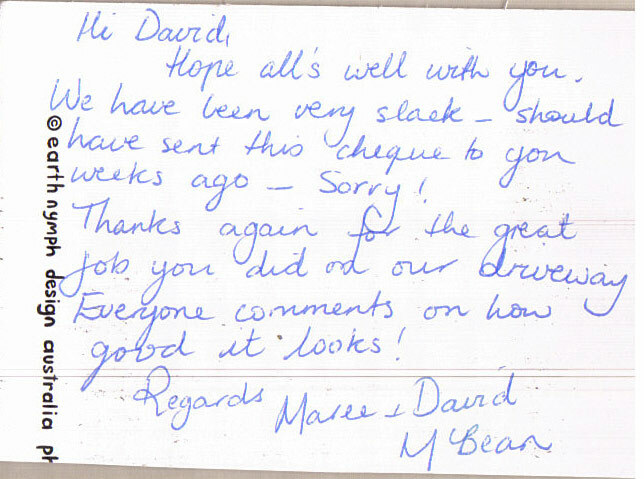 Here’s some of the feedback we’ve had from our customers over the years. None of these testimonials were solicited. 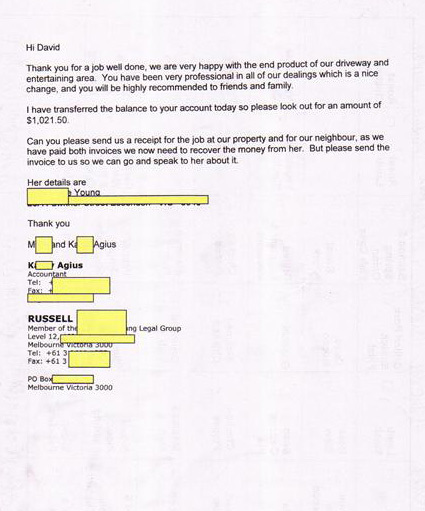 They wrote in to us after we had completed their job. Customers surnames, phone numbers and/or addresses have been blacked out to protect their privacy. If you would like to speak to any of our customers, please let us know and this can be arranged. 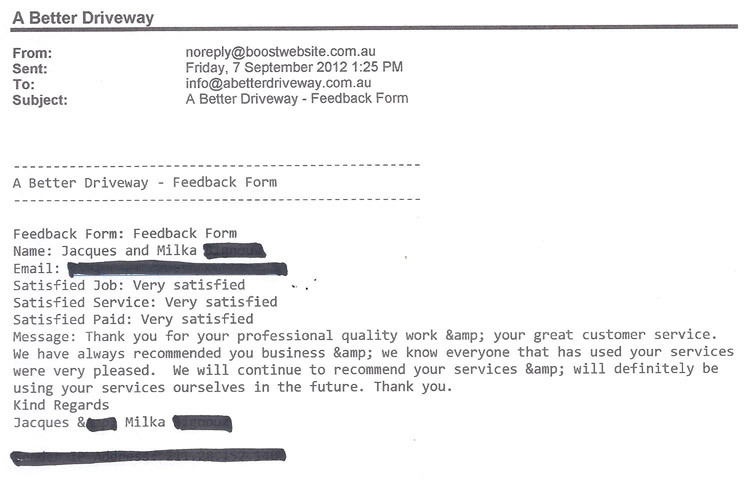 Thanks Antoinette, We are very happy with the works undertaken. The job was handled very professionally. Great customer sevice. Always had quick responses & my questions answered. Thanks for finishing the job efficiently and promptly after commencing. Happy with the results and the attention to detail, and the nice finish! Good work! 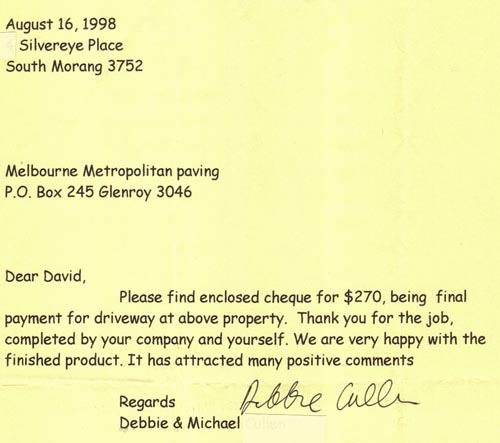 Hi David, Still loving our exposed aggregate driveway that your company did for us however many years ago, and that you cleaned in the last 12 months or so. Hi Antionette, Thank your team on a wonderful job done! We are very happy with the result and will recommend you to others in future. Hi… I’m glad I chose your business to install the driveway … I’m super impressed with the result… Fantastic work fantastic staff to deal with! When I got home last night I saw the terrace finished and could you thank the guys because it is looking just wonderful! It has been such a seamless experience and we would recommend your company to anyone. Fabulous job, no hiccups , great communication, very professional, suggested options I hadn’t even thought of (as in improvements to my original thinking), I’d recommend you to anyone & already have. Three families in the street are now saving to have similar work done. We were very happy with the overall service, we had many delays due to weather and a hiccup with the amount of concrete required but we were informed at each step along the way and were able to discuss any decisions required. We would definitely use again. A very professional service – end result looks great. my wife and i are very happy with the outcome. Always keep in the loop due to unexpected delays due to weather – well done to the whole team. 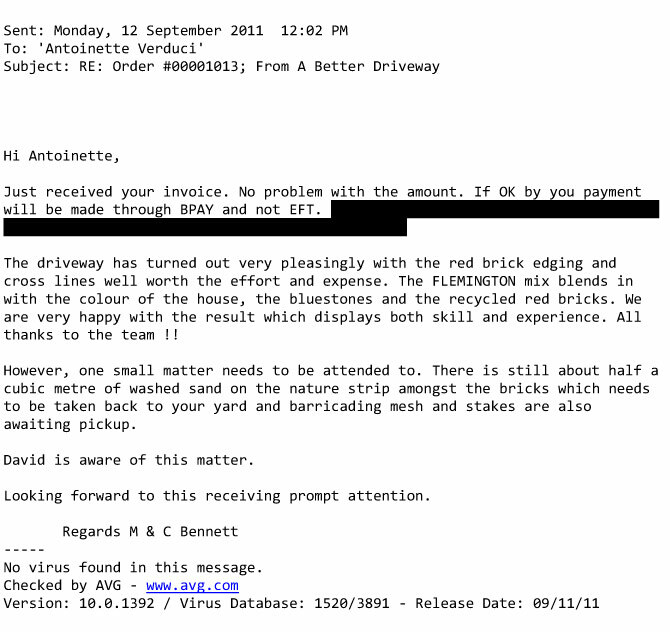 Hi David and Antionette, Thanks for the great work – we’re very happy with the driveway and concreting! Excellent customer service too. Well done to you and your team. The workmanship is fantastic, and the driveway looks amazing! 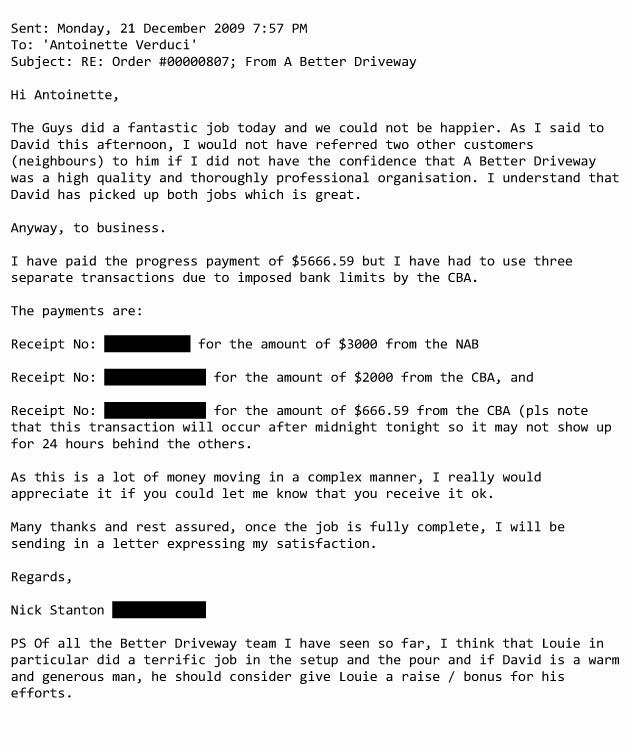 I never knew that dealing with contractors could be so easy! 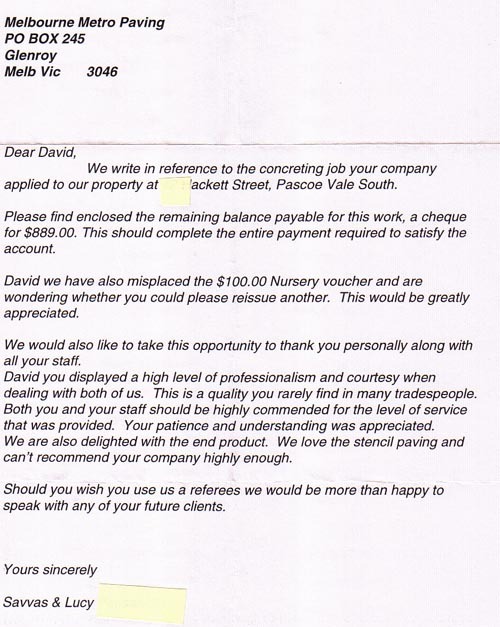 Dealing with David and his team has been a pleasure, from start to finish. No request or alteration was too big or too inconvenient. Highly recommend their work, and would not hesitate to use again. Over all this has been one of the easiest jobs we have done on this house and let me tell you we have done a lot being owner builders. With each and every stage we were informed of what was going on and every one of our expectations were met. Thank you David, Antoinette and A Better Driveway would definitely call you for more work if required. 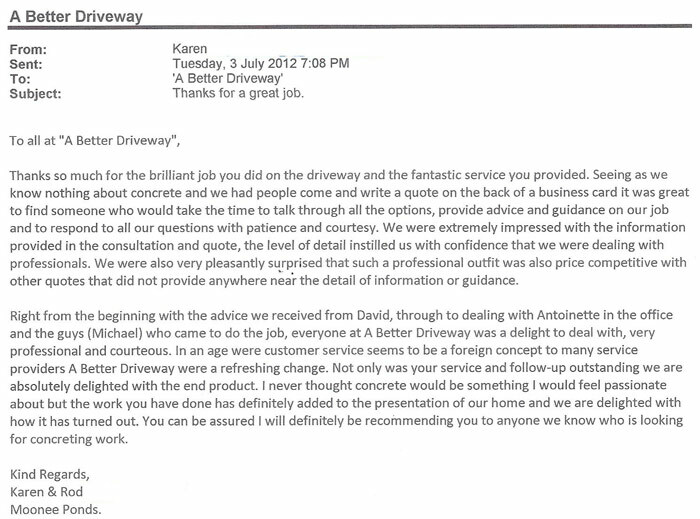 Hi Antoinette, I would just like to say what a fantastic job the team have done with our driveway. 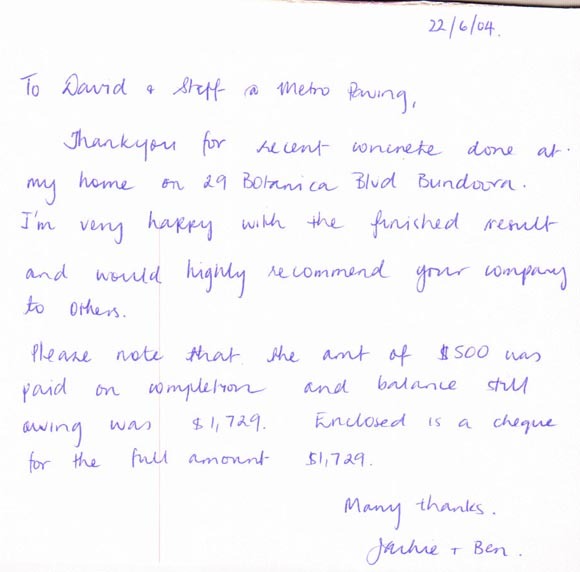 Donna and I are extremely happy with the not only the standard of work, but also the way the job was progressed. If you could please pass this onto David and the team it would be much appreciated. I do have one question, which may be hard to answer given the current climate. I was just wondering what the expected time frame is before we would be able to drive on the driveway? I found photos of their work on Pinterest and loved how they did their driveways. The problem was that I live in California, not Melbourne, Australia. So, I emailed the company in the hopes that I could tell my contractor what they were using. David responded to my email right away and offered to call me. He not only paid for the call, but he spent time explaining and educating me on their process and materials so I could inform my contractor. I was blown away by his genuine kindness and knowledge. It impressed me that he went above and beyond just to be helpful. I wished he worked abroad so I could hire him. Like anyone having building works carried out on their own property I was nervous. I needn’t have been with A Better Driveway. The driveway looks fantastic; but what also makes ABD shine out over the rest of the competition is the level of detail which goes into all aspects of the job. 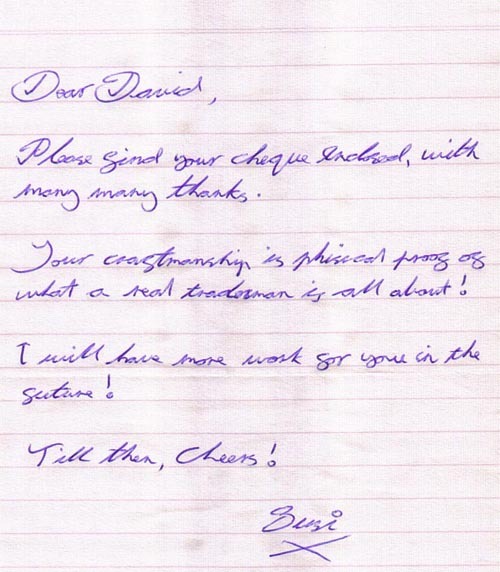 David listened during the quotation, provided alternative suggestions, and delivered an extremely detailed quotation. Prior to commencement of actual building works you’re provided with a complete breakdown on the stages of the build, what to expect in each stage, but also an introduction to each of the people working on-site – so they’re not just random people turning! I also found that not only could you talk with the main supervisor on the day (Shaun), but all of the other guys were polite (handing in mail that was delivered). We had a few changes during the pour process, but this was only a marginal cost increase; so overall we’re very happy customers! Hi David and Antoinette, I just want to say a huge thank you for the brilliant job you have done on our driveway and paths. I have to be honest I got a little frustrated with the change of dates due to the weather and thought to myself: “Hey David this is my driveway not yours.” The fact is I am so glad you treated our driveway as if it were your own. Your fussiness and pedantic attention to detail is something that I really value and I can truthfully say that you are an incredibly good and safe company to deal with. You also didn’t try to over sell either which is absolute integrity at its best. On the contrary, I have been observing the work currently underway on one of my neighbour’s driveways and have been absolutely horrified at the slip slop approach. There has not been the attention to detail that your crew gave. Your employees are just as pedantic as you in regard to ensuring that nothing is left to chance. 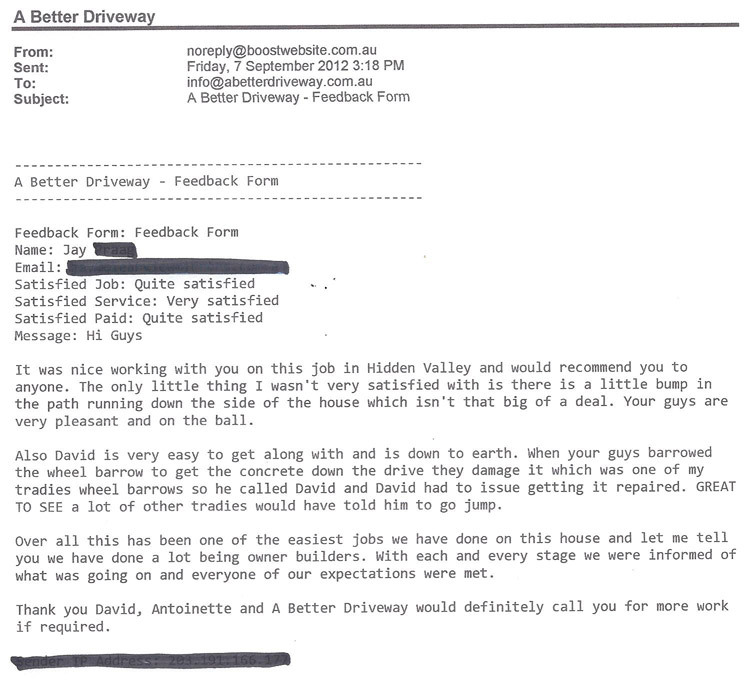 I want to say David that you are the ultimate professional and I am glad we chose “A better Driveway” to do our work. 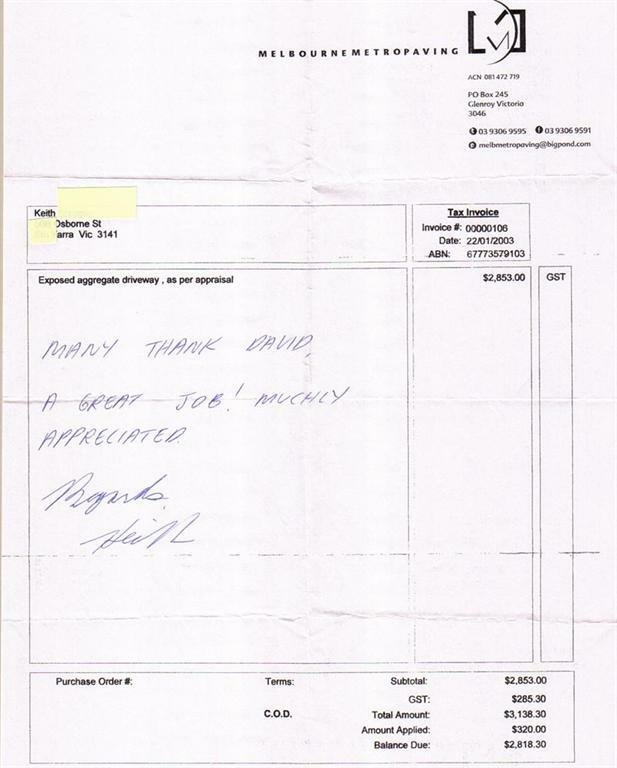 Hi David and Antoinette, We would like to take this opportunity to thank you all for the exceptionally good workmanship and professional service. We are delighted to see how well the driveway has been done. Especially we would like to thank Lou and Chris for getting the levels right in the front. 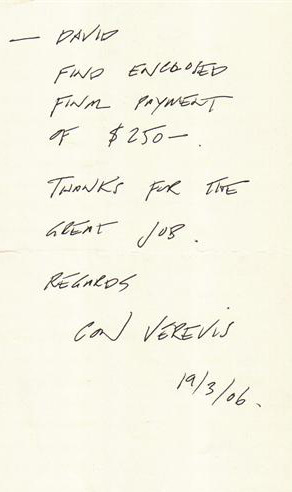 It was not an easy task and Lou was very active in ensuring that it was done right. Also it was an absolute pleasure to chat with Lou on many things. We would also like to thank Lou’s son John Claude for carrying out very hard work in the background. We wish him well with his future endeavours. Micheal did a wonderful job, first by washing the concrete and later today by saw cutting the concrete driveway in an aesthetically pleasing way. Antoinette did a wonderful service by providing us with all the necessary information and maintaining the essential link between us and you. So, we would like to sincerely thank her for that. 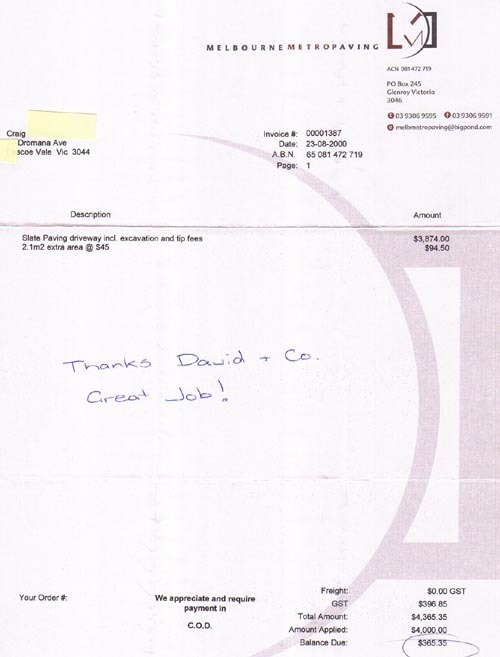 Finally we would like to thank David Dally for his true professional service and honest dealing with us. Both Erosha and I agree that we would not have gone with your company unless David came and had a chat with us in the way he did. 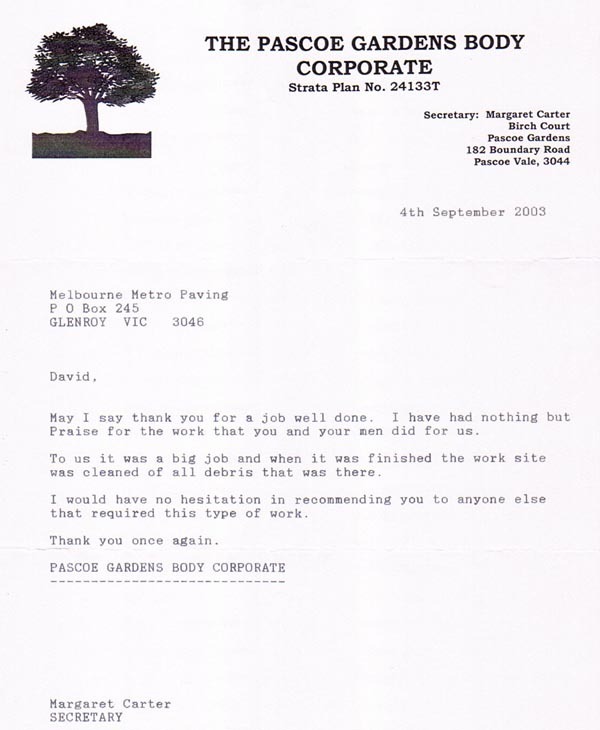 We felt that he wanted to provide a quality service when discussing the job and gave us all the background information necessary for us to be comfortable with the job. Especially, David’s strategy of advertising (i.e. the material provided including the CD and your website with past work) is definitely not wasted and choice of the concrete provider (Metromix) is great. Also, we were impressed to see him finishing off concreting with other workers to get things done when time mattered most. Overall we are very happy with you + your work and it was such a pleasure to deal with you all. We think that we are lucky to get your service. We wish you all the best with your company and please do not hesitate to ask potential clients to contact us if they like know our experience in dealing with you. 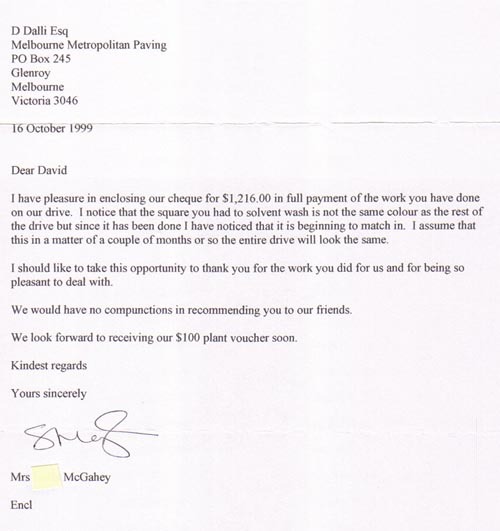 Hi David, Antoinette and team, We would like to thank you so much for your professionalism. The concreting team were very courteous, friendly and approachable and you have both been very helpful and supportive. We would definitely recommend A Better Driveway to anyone that needs a job well done.